(TibetanReview.net, Nov18, 2018) – China says Korea University had apologized to its Chinese students Nov 16 after they complained against Tibet being given a common booth with India, separate from that of China, at an international student festival on Nov 14. However, the students are said to be not satisfied as the apology fails to explain the Tibetan flag on the booth and Hong Kong and Taiwan being given booths separate from China’s. The booth for China’s Tibet Autonomous Region and India was simply aimed at sharing the food of the two, China’s official globaltimes.cn Nov 16 cited the university as saying. Students in the booth wore their regional clothes and prepared their regional food, and had nothing to do with politics, the Global Service Center of Korea University has said in a letter sent to its students on Nov 16. 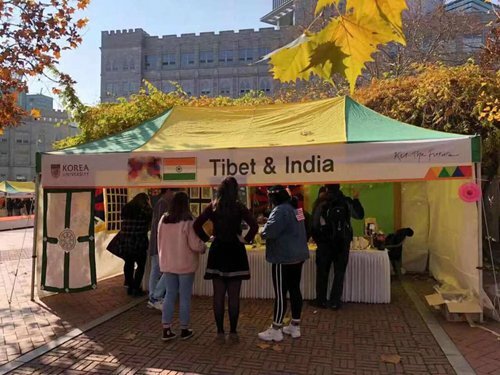 The university has admitted that Tibet was wrongly separated and placed with India and this had hurt the feelings of Chinese students who saw the booth. It has said the event was intended to give students an opportunity to experience diverse cultures without considering Chinese students’ feelings. A news photo of the booth showed that it displayed a Tibetan flag as well as an Indian flag. The Chinese government media report said the university had failed to explain about the Tibetan flag, and why separate booths were assigned for Hong Kong and Taiwan. The report cited the Chinese Students and Scholars Association in South Korea, known to be associated with the Chinese government, as saying the university’s behaviour had damaged good relationship between China and South Korea, and also broken the hearts of 70,000 Chinese students in the country.